Everyone is talking about December 21, 2012, but beneath the hype and conjecture about fate there are some very deep and interesting cultural phenomena emerging. Between economic meltdowns, religious wars, institutionalized corruption in the highest places of government, accelerated technological advances, rapid deforestation along with the pollution of water and air, it is clear that something is coming to a head on our little planet. Even if there was no Mayan Calendar, I’m sure we’d all be talking about these changes. It just so happens that this enigmatic historical date in time has become the focal point of the discussion. It is my hope that the discussion will continue long after December 21, as we are needing to make some dramatic shifts regardless of “ancient prophecies” if we’d like to continue inhabiting a healthy planet. “Don’t play with rubber-bands or you’ll shoot your eye out!”, we’ve all heard statements like this. Sometimes we tell stories to emulate what “could happen if…” and through engaging the idea of a possible future, we may make choices in the now that change or create different sets of future possibilities. We all used our imagination as children the way a little boy is a fireman with the garden-hose, or a little girl pretends to be a mom with her doll, it is human nature. Just like an architect with a 3D model on a computer, or a scientist that turns a theory into an experiment to test a hypothesis, this type of visualizing or play is vital to problem solving. The western mind is a written-centric mind. To make things “literal” from the late 14th century meant, “taking words in their natural meaning” (originally in reference to Scripture and opposed to mystical or allegorical) or (“of or pertaining to letters or to writing”), from Latin littera, litera (“a letter”). The notion of a “literal” statement is a cultural lens. It is entwined in all religious doctrines and is still being played out today in religious wars between monotheistic faiths who have different core books and followers who take every word written literally. This “written justification” was also used to label natives with non-written languages as “savages” to be enslaved or forced from their ancestral lands. Conversely, indigenous peoples tend to come more from an oral tradition rich with allegory, symbol, and metaphor. To say that, “the river speaks to the land with the tears of our ancestors” is a statement full of truth for many Native Americans though it might sound ridiculous if one were to take it literally. The notion of taking the end of The Mayan Calendar literally as “The End of The World” is a cultural misunderstanding though it may be helpful in making us consider the path we are currently on. It may be an inaccurate “literal” western projection of apocalypse or armageddon, but the truth of our current situation on Planet Earth can not be ignored. Some prefer fatalism, it’s a great coping mechanism for anyone who thinks the problems of the world are insurmountable. “If the worlds gonna end and it has already been prophesied then I don’t have to do anything about it.” Some prefer to blame man’s problems on God who will enact a just punishment at the end of time, and some use science to show us that there is absolutely no proof that the world will end. Yet deep inside we all know that each of these approaches is skirting the truth of our own role and responsibility in shaping the future. We can light a candle, burn some sage, pray with all of our holy books and fund science until we are blue in the face but none of it will matter if we we don’t address the choices we are making now and how they will effect our future. The world we live in now is filled with technological gadgets that are beyond the musings of a great science-fiction novel from a half century ago.Martin Cooper, has stated that watching Captain Kirk using his communicator on the television show Star Trek inspired him to develop the handheld mobile phone. We humans have dreamed worlds into being yet we are still quick to draw limits on what is possible. 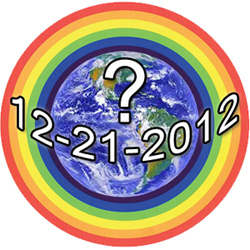 These next 2 weeks will be filled with discussion about 2012, The Mayan Calendar and prophecy. One meme has gently been planted in my mind and I can’t help wonder what it might sprout into. I’ve seen it on Twitter, and Facebook #unify the initiative at unify.org has taken the notion of prophetic fiction to new heights. Though it may be a lofty notion, an unreachable goal, who am I or you to place limits on what is possible? Am I foreshadowing my next article? Of course! Not without a critical eye, but with a hopeful heart, I have been dreaming that something unexpected and beautiful beyond words would take the world by surprise on December 21, 2012. No longer satisfied to wait for government leaders to drag their feet on global issues that effect us all, no longer can we allow national or economic interests to outweigh our global conscience. We need to find that place within us all that knows we are interconnected and interdependent regardless of our faith, our nation, our beliefs. The time to act is now. We are the ones we have been waiting for and we are not waiting anymore. Is this fact or prophetic fiction?